Autism-Europe is an association gathering almost 90 national and regional associations advocating for the rights of people with autism from 30 European countries. Autism-Europe’s statutes have been drafted to ensure the representation of all the countries of the European Union in the Council of Administration. The large majority of the members of the Autism-Europe’s Council of Administration are parents representing children with any kind of severe developmental disorder who are unable to represent themselves. Moreover, a number of seats in the Council of Administration are reserved for self-advocates. All Autism-Europe’s members have the right to participate in the Annual General Assembly. Every two years the General Assembly elects the Council of Administration. Half the Council of Administration is renewed every two years. The Council of Administration elects the President amongst its members. The President must be a person with autism or a parent. The president names five or more Executive Committee members, who are proposed for approval by the Council of Administration. 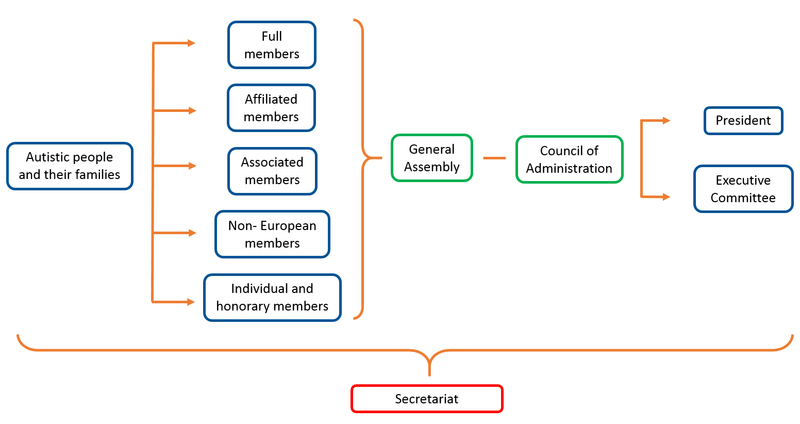 The Executive Committee is an operational body that takes in charge all the practical issues concerning Autism-Europe’s management.